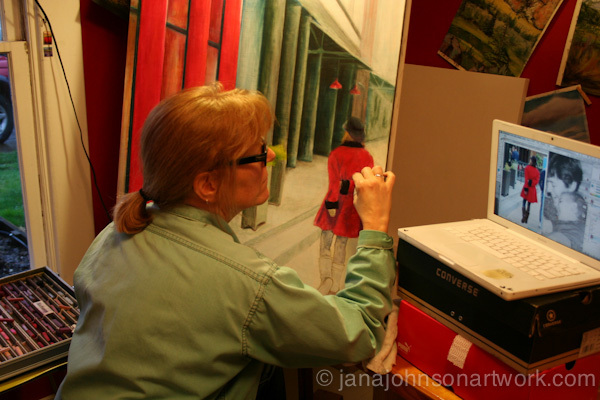 A purveyor of exuberance, Jana Johnson throws vibrant color into all her varied artistic productions. She has been a self employed professional artist since 1982 and her work is held in many private collections. She’s participated in numerous group and juried shows in galleries throughout Oregon. Her artwork is represented at Art In The Valley Gallery in Corvallis Oregon. She is involved with the Vistas and Vineyards plein air group that meets at various locations in the Willamette Valley. All original artwork is painted on archival paper, or on canvas surfaces she has prepared with a water based primer. She uses a variety of materials ranging from Daniel Smith and Windsor Newton watercolors to Schminke, Unison, Rembrandt or Terry Ludwig pastels. Lately, Jana has chosen to focus on pastel, watercolor, and acrylic monotype printmaking, seeking to further enhance the strength and spirit already so warmly expressed in her work. What feeds my soul is color - rich, vibrant color, whether it’s a glowing landscape, brilliant red poppy or the nuances of light and shadow seen in the curve of a turning face. Capturing that color on canvas with pastels or paint is a challenge and when I’m successful I love to share these pieces of my heart with others that enjoy their own interpretation of what they’re seeing. Curiosity is also a driving force of mine as I experiment with new materials, techniques and invent new ways to express my views. Please join me on this artistic journey - it’s truly an adventure!